Polystyrene absorbers offer many advantages over their polyurethane foam counterparts, however they did not perform well at microwave frequencies. Comtest has changed this by introducing the new Javelin Tipped MT45-JT: a polystyrene absorber that is able to match the performance of traditional polyurethane foam absorbers while maintaining the characteristics that make polystyrene so incredibly durable and eco-friendly. The MT45-JT owes its name to its recognizable Javelin tip. 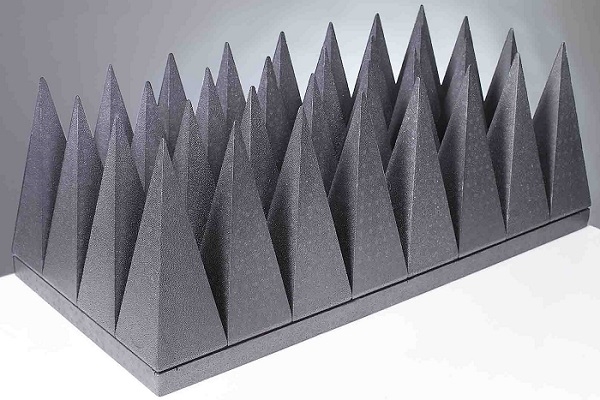 This specially designed tip allows the absorber to operate at frequencies from 500 MHz all the way up to 40 GHz, meaning the polystyrene absorber can now perform just as well as traditional soft foam absorbers, making it a better choice for use in full anechoic chambers and antenna test ranges. Unlike polyurethane foam absorbers, the new MT45-JT absorbers have superior rigidity and tensile strength, they are compliant with all necessary fire retardant standards without the use of hazardous materials and they are highly resilient to humidity and changes in ambient temperature. Polystyrene absorbers are closed cell products that are certified for use in clean rooms hence they don’t leach particles and black dust. This results in an extremely durable (and virtually maintenance free) product that comes with a 25 year warranty and is expected to last well beyond that. Comtest exhibited its new MT45-JT absorber at the 39th annual meeting and symposium of the Antenna Measurements Techniques Association in Atlanta Georgia. For more information on this product, click here.